What is a solar oven or solar cooker? What is solar cooking? We will shed some "sun light" on this relatively new subject and introduce the art of cooking your everyday food with the power of the Sun. The science of solar cooking is not that new. It was first attempted on a controlled scale in the mid 1700's by French-Swiss scientist Horace de Saussure. These attempts were reported in the first-published study of solar cookers in 1767. Since that time though, relatively little has been accomplished in the field of solar cooking as far as feasibility and practicality for use on a large scale - until recently that is! Solar cooking has only really been of interest over the last twenty years. Much has been learned and applied in the field of solar cooking in these past couple of decades. There have been advancements made in the areas of commercially produced, quality, economical and practical solar cookers and solar ovens. Great strides have also been made in the area of distribution of solar cookers world wide. Solar cooking is a great alternative method of cooking in parts of the world experiencing a scarcity of solid fuels available for cooking. For more information, please read the FAQ's below. For in depth information about a solar oven, solar cooker, solar recipes - and a whole lot more to do with solar cooking - visit our favorite solar cooking site. Can a home made solar oven really cook food? How long does it take to solar cook food? But as most practitioners of the art have discovered, much of the time cooking can be accomplished in equal or only slightly longer durations than traditional methods of cooking. As an example; on a mid summer day at midday on a cloudless afternoon you can do a casserole dish of home made macaroni and cheese from start to finish in about three to four hours - and that would include browning the sausage beforehand, cooking the pasta, combining all ingredients and then placing the whole mixture in a casserole dish and finishing the requisite cooking time indicated in the recipe directions. An egg can be fried in about seven minutes and white rice can cook up in about thirty minutes, just to give a few more examples. Cook times and durations can depend on many factors including the cooks themselves. Practice, experimentation, and time will produce more satisfactory results as you discover the pleasures of cooking with the power of the sun. How many kinds of Solar Cookers are there? Which solar cooker is best to use? For baking, a box cooker would be your best overall cooker. For stews, soups and meats; a pot and panel cooker is great, and also a box cooker works fine for these foods. The combinations and possibilities are increased though when combining the features and characteristics of each type of solar cooker. How hot can a solar oven get? The best solar cookers can get as high as 600° F which is very unique indeed. Of course this is a unique cooker that can reach these temperatures. Solar cookers that reach these temperatures are highly specialized and very intricately designed parabolic cookers rather than a traditional solar oven. A solar oven is usually an enclosed box type cooker with or without the use of reflective panels. Some solar ovens will reach 400° F but most usually cook at temperature ranges between 250° F to 350° F, quite sufficient for cooking most foods. Panel cookers which are similar in principle, use a reflective panel to concentrate sunlight on a cooking pot that is usually covered by a plastic oven bag or glass enclosure to retain the heat. These can reach temperatures of 350° F and more (depending on food) and usually cook between 200° F and 350° F.
What times of the year can I cook? In many areas of the Southern United States and into the more tropical and arid regions of the world that have closer proximity to the equator you can cook year round; weather permitting. In the northern states and countries such as Canada, Europe and northern Asia you will usually be limited to the summer time when the sun's trajectory is higher in the sky. Why does the cooking pot have to be black or dark? Dark colors attract, and retain the energy from the sun's rays better than light or shiny cooking pots.A dark colored metal pan will attain a far higher temperature than will a shiny aluminum pan in the same way that a light colored shirt will feel less hot than a black shirt.Lighter and shinier surfaces will only reflect the sun's rays away from the food. Why does one use shiny reflectors on a solar cooker? Do I have to turn my solar cooker to track the sun? In order to achieve the maximum and most efficient cooking temperatures and capacities, you can adjust your cooker frequently to gain the extra advantage, but in general it is not necessary to do so. Most box cookers do not need to be repositioned very frequently and panel cookers only slightly more often since the panel reflectors can shadow or prevent the sun's rays from reaching the pot when it is blocking the ray's path. Frequency of adjustment can also depend on the time of the year, summer being prime coking time and winter requiring more adjustment to the sun's trajectory in the sky. 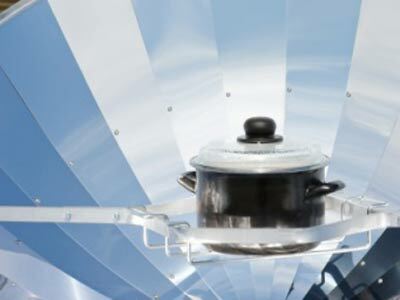 Can you use a solar cooker for canning or preserving? Yes, you can do so within limits. The only foods you can do this with are fruits and at times tomatoes.Other foods require high pressure and high heat canning methods to prevent food borne illness through bacterial contamination. I understand you can pasteurize or sterilize water with a solar cooker? Are there risks of food borne illnesses possible with solar cooking? Yes, there are risks with food borne illnesses, just the same as there are risks when preparing and cooking in the traditional manner. The key to preventing any food borne illness is to follow standard washing, disinfecting and preparation guide lines set up by the Health and Safety administration. Below you will find an excellent, short, detailed outline of basic information on food safety. Will a solar oven kill harmful bacteria (pathogens)? Is it safe to cook meat in a solar cooker? Most professionally manufactured solar ovens are capable of reaching and sustaining the requisite temperatures needed for cooking meats and all other types of foods.And most, well built, home made solar cookers can perform the same task just as well or better than a commercially manufactured cooker. How can I learn to use a solar oven or solar cooker? Well, you can always “wing it”, learn by trial and error as some do. Or you can research the information from books and the internet. The best way though would be to seek out a demonstration or a class being offered by individuals or organizations within your local community where you can gain some hands on experience and guidance from those who have practiced the art for a while. These individuals are more than happy to share their abundance of knowledge on solar cooking with a solar oven. See this USA Solar Class Locator page for information in your area.